An Introduction to Debian Packaging is a PDF created by Lucas Nussbaum, designed to tell you what you really need to know about Debian packaging, keeping a resonable size. The guide doesn't attempt to be complete but it's great if you want to start making your own .deb files or simply understand how the Debian packaging works. Note: If you're using Chrome to open the PDF, the text is not readable because of the background. Download the PDF and open it in a PDF viewer instead and the font will look ok (or use Google Docs). 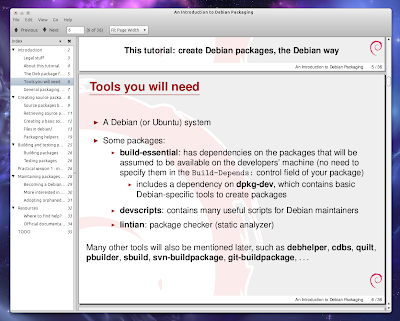 Download "An Introduction to Debian Packaging" PDF | Open the PDF with Google Docs. For the full Debian packaging documentation, refer to The Debian New Maintainers' Guide or the Debian Policy Manual. There's also a small how-to on this available on WebUpd8: How To Create A .DEB Package [Ubuntu / Debian] (it's pretty basic but should be enough to get you started).